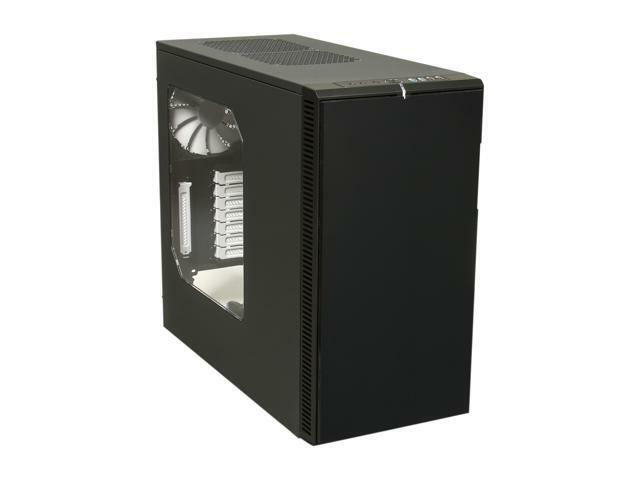 The Define R4 is the latest in the Define series of silent computer cases. Building on the award-winning foundation of the Define R3, the R4 retains minimalistic yet elegant styling with extraordinary performance, noise reduction features, premium build quality and unparalleled value in this price range while adding a suite of innovative new features. No longer are you forced to choose between silence and support for liquid cooling, the Define R4 offers both. Top fan positions now allow slim 240 radiators to be mounted internally and select slim radiators can also be mounted in the front fan holder. An integrated fan controller is easily accessible behind the front panel, putting fan control at your fingertips. Cable management and intelligent layout are taken to new levels with the option of mounting up to two 2.5in, SSDs on the reverse side of the motherboard tray, effectively mitigating visible cable clutter. When it comes to cable routing, the Define R4 has it covered. Over one full inch of cable routing space behind the motherboard plate has been achieved by widening the case by just 8mm. This mid-tower case is a great choice for everything from gaming enthusiast systems to silent home theater and corporate applications. The R4 comes pre-fitted with dense noise absorbing bitumen material on the front, top and side panels. The exclusive ModuVent TM System provides three panels which also have noise-absorbing material; these panels can be removed to expose three air vents for additional fans for high air flow applications. Rubber padding on the case feet, anti-vibration pads for the power supply and HDDs also help reduce noise. Configuration flexibility is enhanced thanks to two hard drive cages (featuring steel drive trays with black silicone mounting grommets) that support a total of eight 3.5in. HDDs or 2.5in. SSDs. The top five-bay cage is easily rotatable and removable; removing the top cage allows support for graphics cards up to 470mm in length. The bottom three-bay cage is mounted to the chassis by screws instead of rivets, allowing you to easily remove both drive cages for complete flexibility. The spacious sleek black interior can support CPU coolers up to 170mm high. If cooling becomes more of a priority, this system can support up to seven fans with removable, washable filters to provide airflow from five sides of the case. The case also includes cable routing cutouts with improved rubber grommets to ensure greater fit and retention. The bottom of the case has a filter over the power supply and 120/140mm intake fan vent which can be easily removed for cleaning. Fully Transparent Side Panel Window The acrylic window side panel features the same clean, Scandinavian design as the case itself, and has a completely flat outer surface without any plastic bezel or rivets, allowing you to display your setup in style. Optimized for Noise Reduction Pre-fitted with dense noise-absorbing material, the R4 also features ModuVent panels which prevent noise from escaping unused fan vents when silence is required. If cooling becomes more of a priority than noise reduction, the ModuVent panels can be removed to expose additional air vents for optional fans. Support for Liquid Cooling You no longer have to make the choice between liquid cooling and silence, the R4 offers both. Top fan positions now allow slim 240mm radiators to be mounted. Select slim radiators can be mounted in the front fan holder (requires the bottom HDD cage to change position). Innovative SSD Mounting Options Hide those drives! Take cable management and interior cleanliness to a whole new level. Mount up to two 2.5in, SSDs out of sight on the back side of the motherboard tray. Integrated Fan Controller Fan control at your fingertips. The integrated fan controller is easily accessible behind the front panel and manages up to three fans, allowing you to tailor the fan speed to your needs. Advanced Cable Management Over 1in. of space behind the motherboard plate means cables can be conveniently routed through five rubber grommets into a generous compartment behind the motherboard to reduce cable clutter and improve airflow. 18.27" x 9.13" x 20.59"
Pros: I love this case. Built my PC almost 5 years ago and have done some tweaking and upgrading and this case has been a joy to build in all along. When it came out it was chock full of innovations that are now almost standard. Newer revisions of this design have come out and reading the specs those cases are even better, but if you find a really good deal on this one it may be worth getting nonetheless. - Excellent airflow, can mount six 140mm fans, great watercooling support. Can even mount a thick 280mm up front if you remove the HDD cages. - Classy color scheme, Fractal cases look like tuxedos. Other Thoughts: Other case makers try to innovate, but they seem to always miss on something. Fractal cases always seem to be just right. Pros: -Tons of room in this case. A Hyper 212 EVO fits perfectly without any clearance problems. Also, the top hard drive trays can be taken out to create more room. Lots of hand room to manage cables. -The front fans and the bottom fans have dust filters over them, making them extremely easy to clean. -Looks sleek, no stupid gamer garbage making it look gaudy and cheap. Giant black box with simplistic design makes it look like a computer. -The case comes with tons of extra screws, zip ties, thumb screw top (so you can use ANY screw like a thumb screw), and washers/dampeners for the hard drive trays. -Top fan slots fit a water-cooled radiator + fans PERFECTLY. Highly recommended if you want to water cool your CPU. Cons: -To get to the dust filter and front case fans, you have to take off the front door and its frame. Easy, right? Well, the frame for the door also houses the power and reset buttons, speaker in, mic in, and USB ports, so when you pull it off, you run the risk of pulling out some cables that are hard to get back in. Be gentle and this won't happen, but is supremely annoying if you're dealing with cleaning the front fan. -Very large, very heavy. Not necessarily a con, but it is advised that this thing is thicc. -The rubber cable management slots kept falling out. They don't fit in very well at all. Very minor. No grating on top with empty space going into the case (so if you spill something on it, you're not screwed). Mine is in my desk, in an enclosure, so I am not worried about it. Plenty of room for an ATX motherboard, wires, power supply, CPU aftermarket water cooling block, extra fans. Really easy case to work with. Grates where air is brought through and exits the case have filters on them and they can easily be cleaned by simply removing them and rinsing them with water. I like the simplistic design. I saw some feedback saying that this model with the side window runs louder but I literally cannot hear my computer, even though it is currently on. Love the USB ports on the front. Cons: Some flaws. The rubber parts where wires are threaded through for professional wiring kept falling out on me. Some threading on the screw holes were easily stripped. The front door panel, whilst brushed aluminum and looks cool, doesn't lock open. It's like a bar door. It will swing back. If you jerryrigged a disk drive behind the door, be careful with that. Other Thoughts: Whilst I found a lot of minor annoyances with this case, hence 4/5 eggs, I really love the foam padding and overall design. This case is *very quiet*. I love it. Doesn't even sound like my computer is on for most tasks. Of course, if I am gaming, I will turn the fans up, but it still is more quiet than my last case. Cons: - The power button didn't work when the case arrived. Took a whole night/morning of troubleshooting, but finally figured it out. Luckily nothing was defective with the button itself, but the wires near the button had become disconnected. Once realized, it was a quick and easy fix to get it running at 100%. Little solder, hot glue, done. Other Thoughts: Not sure if the power button didn't work because of QC or shipping/installation. Minor inconvenience, could be avoided with a little more attention from manufacturer. Overall, super impressed. *Lots of openings for cable managment. *Panels on both sides come off very easily. *Did not realize it came with a front fan speed controller for up to 3 fans...but it works well. *Lots of water cooler options. *Overclocked i5 temperatures are very cool, so seems like the ventilation works well. Cons: *It advertises as having one 3.5 external spot. I was going to use that for my 3.5 card reader. There's a cut out panel in one of the 5.25 spots for what looks like *could* be 3.5 slot, but it's welded into place. Had to pry that bad boy out with a flat-head screwdriver. Even if you somehow were able to cut out that 3.5 section of the 5.25 panel (and I'm not exactly sure how you can do it, given space constraints! ), you would still need some sort of an adapter to hold a 3.5 card reader in place. So plan on buying one of those cheap 5.25-to-3.5 adapters elsewhere here at Newegg....problem solved....or almost! *If you plan on using a card reader in one of the two 5.25 spots, it will fit fine....but you can't close the front panel door if there's and SD or CF card in the reader. I might have to offset the reader back an inch or so. Not a big deal...but as a photographer, I constantly have CF and SD cards in there, and it would be nice to be able to close the front panel door with the cards in the reader. Other Thoughts: *My system includes: i5 w/ ASUS Z170-P mobo and H75 Corsair water cooler. *Front two 140mm fan spots clip into place....no screws required. Doesn't look like you can mount 120mm fans here, but I'm not sure you'd want to. *So to review....twin front and twin top fan spots are for 140mm fans only. The single rear and bottom fan spots give you 120/140 option. *I have low-rpm fans in all of my fan spots, but the bottom and top fan spots come with covers that screw in (if you are not using them). Very nice touch. *I paid more for my last Antec case 10 years ago....and this is definitely a step up in just about every way. *If you are looking to put a brand new card reader in this bad boy, I'd probably just buy a 5.25 reader and be done with it. Just simpler in the long run. *If you can score one on sale, it will be about the best case I've seen in this price range. Pros: Sturdy, quiet, and plenty of room to work in/plenty of cable management methods. Other Thoughts: I definitely would recommend this to anyone wanting to build something that's low profile and sturdy, just be careful of the side panel windows in accordance to how sharp your fingernails are. Other than user problems such as the Headphone Jack breaking after using it for 6 months, I'm giving this case 5 stars. With good maintenance, this case is viable to last a very long time (years and years even) very high in quality, and the cooling options are almost unlimited.